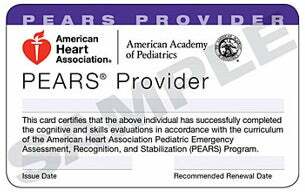 Pediatric Advanced Emergency Assessment, Recognition and Stabilization (PEARS)® is updated to reflect the 2010 AHA Guidelines for CPR and ECC, PEARS helps healthcare providers develop the knowledge and skills needed for emergency evaluation and treatment of seriously ill infants and children. Target Audience: MDs, PAs, RNs, NPs, EMTs, Paramedics, Respiratory Therapists etc... who do not have frequent exposure to pediatric emergencies. The Clinical Training Center schedules PEARS classes as requested. Contact us and we will schedule a class to suit your practices needs and schedule. Students must complete the American Heart Association PEARS Pre Course Evaluation before taking the program. Access to this test is included with your textbook. If you have difficulty locating the code, please contact the CTC for assistance.